Changes in altitude from mountain climbing, diving and air travel can lead to headaches in the facial area. Obstruction by mucous, nasal polyps or abnormalities in the nasal passages may block the small air cavities inside the cheekbones, behind the bridge of nose and just over and behind the eyes. 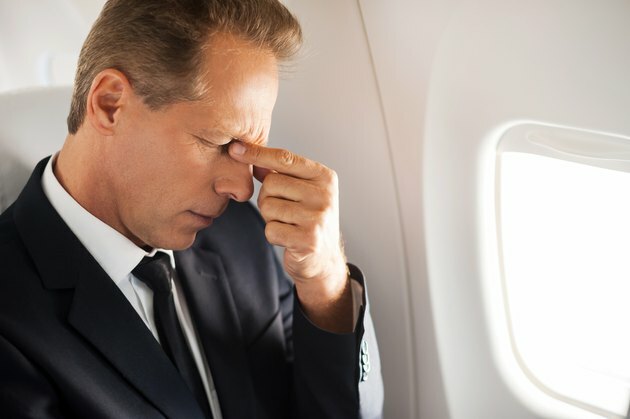 Severe sinus pain can develop in response to air pressure changes if you fly with a cold or sinus infection. The sinuses, which reduce the weight of skull bones and provide chambers to resonate the voice, connect with nasal passages through narrow openings. Sinus pain involves pressure or pain around or behind the eyes. The pain stops when the pressure inside the sinuses equals the pressure in the surrounding tissue. Gases dissolved in the air expand with increasing altitude and contract with decreasing altitude. Under normal conditions, the sinuses equalize the pressure inside the head. Pressure builds up when the gases expand and are unable to escape because the narrow openings are blocked. Infections of the ears, nose or sinuses increases the risk of sinus pain with altitude changes. Sinus infections or abnormalities, or respiratory illness, may cause mucous to build up and block the sinuses. This blockage may keep the sinuses from equalizing the pressure. Swallow or chew gum to help keep the sinus passages open. Avoid recreational diving or flying if you have a respiratory illness. If you must fly, use a nasal decongestant before the flight. Try not to bend forward with the head down, as this may increase sinus pressure. Over-the-counter pain medication such as acetaminophen and ibuprofen may reduce or relieve the pain. Complete relief of sinus pain, however, requires reduced pressure in the sinuses and may happen only when the flight is over. In its “International Travel and Health 2007” report, the World Health Organization suggests trying the valsalva maneuver to relieve pressure. To do this, close the mouth and pinch the nose, then perform a short exhalation against the pressure. Facial pain headaches that persist may have a different cause than sinus pain and should be evaluated by a medical professional. Headaches experienced by mountain climbers or from travel to high altitudes may be part of altitude sickness, also called acute mountain sickness. Altitude sickness is the body's response to decreased levels of oxygen in the air. In addition to sudden headache, symptoms may include shortness of breath; feeling tired or dizzy and unable to concentrate; and nausea and vomiting. These symptoms also resolve with a return to lower altitudes but may require oxygen and additional medical treatment.